with so much awfulness and craziness since tRump in office so much is easily overlooked, thank you, very very good post!!!! Have already signed the petitions; Brown signed some legislation intended to increase affordable housing in recent weeks and reduce that portion of housing scarcity pushing rents up. I understand Oakland is striving to find a way to prevent such greed induced homelessness and evictions--think there is a two year bill that didn't make it to the governor this year. Apparently teachers and administrators didn't received appropriate history in their education either and thus they are trying to doom us into repeating the mistakes that allowed the Nazis to take power last century. May the furies push the arc toward justice in both important issues Joanne. Noted and petitions signed. Almost 9 years ago I was priced right out of my hometown, Oakland. May the furies let "Governor" Brown know that he is Failing his 99% constituents ASAP! Alecto: Kudos!! to those teachers who stood up against this vandalism and turned it into a life's lesson in the classroom(s). Only to be reprimanded by the spineless Super, who obviously was kowtowed by the bully's parents, and not supporting and standing with his teachers. *A couple years ago, before I retired, (Education), one of the 8th grade classes had a Skype conversation with an elderly Holocaust (Shoah) Survivor. The violent experiences that she recalled, and talked about, (she lost most of her relatives in the camps), still reverberates with me, and is a life's lesson about history, I will never forget. Magaera: This is so depressing and very sad. I hope this gets resolved!!! 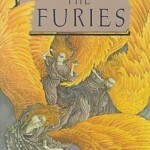 Set the Furies free, they have a busy week coming up, I'm sure! If men could learn from history, what lesson might it teach us! But passion and party blind our eyes, and the light which experience gives is a lantern on the stern, which shines only on the waves behind us! But that doesn’t mean teachers shouldn’t try and certainly not that the should be stopped from trying by those blinded by passion and party! Megaera: what can I say, landlords here simply wouldn’t be allowed to do that, not even in Amsterdam where the prices for (rental) houses are going through the roof. People are reasonably well protected her by law, even where private rentals are concerned. In California people are apparently denied protection under the Costa Hawkins Rental Housing Act. Start there and resolve this soon, Megaera. "Alecto, if there was ever a need for education about who and what the Nazis were, and why they are not to be emulated, it’s right here and right now – all over the United States, and not just in schools." The Holocaust was 80 years ago. It had its beginnings just over a hundred years ago as Germany infiltrated England with pro-Nazi sympathizers. There is an outstanding fictional series that begins about 1915 written by Jacqueline Winspear, a British citizen living in California, the Maisie Dobbs series which I was fortunate to be led to just after the first book went into paperback. I've bought them all in hardcover ever since. It is the most meticulously researched material I've read from that period (Herman Wouk is outstanding from the mid-30's on). She has a female protagonist rising from very humble beginnings following the events of the times from WW1 with its unique horrors, and intrigues, now into the 30's in Germany. Her books are ostensibly mysteries but are as much history in my opinion, as are Wouk's personal stories but intensely researched and historically accurate. In truth, I learned more world history from those two than any academic history class. Point being, perhaps both, or something similar needs be taught these days as it is just unthinkable to me that the Nazi party and its pogroms along with the Holocaust can EVER be normalized in ANY way. That such is happening is evidence, to me, of a moral decay in this species that, were I a deity, would cause me to wipe it out. There is rot at our core and I do not think any longer education can fix that. This is visceral, an essential part of who we are as a species and we are rotten at our very center that such things could be forgotten so quickly and normalized again ever. We make me sick. Sick to the center of my being. Horrifying. How eloquent and visceral your words Gene. I am sickend that those who lead the USA are allowed to Behave no better than the traitorous turncoats of the the Confederacy and are called good people by the president when these murderers speak of erasing Jews. Someone must instigate and stage a public Mock Trial of the Generals and Conspirators of the Civil War. Immediately following a guilty verdict, all of the Statues must be blindfolded and shot along with their horses then melted down. I intend to read the books Gene read. I was born in the south but not the deep south and I can't get enough history no matter what country it comes from. You know the Billionaire class will have to marry, re-marry, intermingle and keep the dna in the family to keep it pure. We can already see how that turned out for the royals and the 3rd reich. Not familiar with Jacqueline Winspear (thanks for the referral Gene), but I am familiar with detective stories and their authors being underestimated. Does anyone remember "Name of the Rose" and all the hoo-hah over "finally a detective novel that rises to literature"? I remember reading it (mostly not bad, though a little stiff), coming up to the revealing of the method, exclaiming, "Oh no! Not the old poisoned pages cliché again!" and metaphorically throwing it across the room.